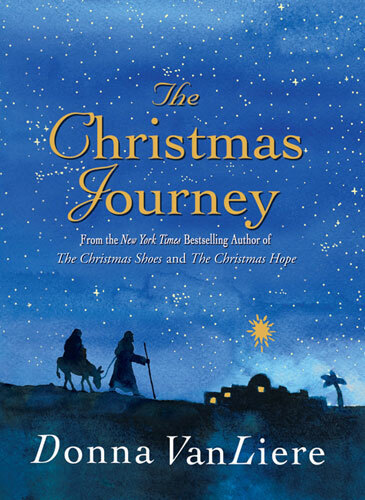 The Christmas Journey is different than her other books in that it is actually a narrative that she wrote and read at her church's Christmas banquet. It is a elaboration (but not so very) on the story of Joseph and Mary's journey to Bethlehem and Christ's birth. VanLiere adds some conversations between Joseph and Mary that you won't find in scripture, but she gratefully keeps it at a minimum. (I'm still not sure what I think about fictionalized stories based on Scripture although I'm generally inclined to be suspicious towards them.) I thought VanLiere did a tasteful job just describing the emotions that a teenage mother might feel as she is preparing to give birth to a baby. But this, of course, is not just any baby. It is the Savior of the World. VanLiere said that she wrote this narrative in order to remind herself and others that the story of the Nativity is not clean and neat. She wanted to remind people that it was a messy birth and it humbled Mary and Joseph. She wanted to describe a scene that wasn't taken over by the modern Christmas industry and fan fare. It's not just about a little Nativity scene that we put up in our homes, or twinkle lights on a Christmas tree. Rather it was dirty, rough and altogether miraculous. I think she accomplished her goal fairly well. No, this is not a novel. It is a fresh reminder that God came down to earth as a little baby to redeem His people from their sins. Beautifully done! On that note, not only was I offered a copy to read myself, but I was also offered a giveaway copy for one of you. Would you like to read The Christmas Journey for yourself? Simply leave a comment below. This contest is open to US AND CANADIAN RESIDENTS and will be open through Sunday, December 5th. THIS CONTEST IS NOW CLOSED. THE WINNER (as selected by random.org) IS #1 - AMY! Congratulations, Amy! I love Donna VanLiere and this latest book sounds great! Thanks for the giveaway opportunity! Yes...count me in! I always enjoy your book reviews, side note: my girls and I are currently reading TumTum and Nutmeg. We just finished their Christmas adventure last night. Thank you for introducing them to us. Our copies come from the library, but the girls put both books on their Christmas wish list! I love Jen's comment about Tumtum and Nutmeg! That's so sweet that her girls are loving them! This sounds interesting. I saw that it is 96 pages. Is it illustrated, or more for adults? A read aloud with older kids? Sounds like a great book ... thanks for the chance to win it! How is it that we're both reviewing and giving this book away on the same day?! Great minds . . . I enjoyed your review and would love to read The Christmas Journey :) *Thanks* for the giveaway! I've not heard of this author, but i personally like stories based on Scripture that have dialogue -- it helps me get beyond the sometimes all-too-familiar stories to see what really was happening: as you say, not a neat little romanticized scene, but a teenage mom away from her own mom and family, in a not very nice place. For me, it helps me appreciate better what the people went thru. I'm going to enter this one for my momma. She would love to read it. Very sweet book. We all could use a reminder, especially this time of year. Sounds good, Carrie. I LOVE the movie "The Nativity"--might they be a little similar? Hi Carrie! I was actually stopping by to let you know I got your box in the mail today, I popped down to the local fishing village and sent it on its way, so I hope it arrives in one piece. And I would love to be entered into your giveaway! This sounds like a great holiday read. Thank you for the giveaway. I would love to build my Christmas book collection. Please enter me. This sounds like a great read...count me in!